Like March, these truffles come in like a lion and go out like a lamb. It's the first touch of tongue against powdery unsweetened cocoa flecked with sugar and lime zest that creates a pucker and paves the way for a ganache that's as smooth as Jamie Foxx's come-on. I cut the recipe in half myself, but it made for odd measurements (3/8 of a cup, anyone?) and they keep so well that there's no need to. You might want to make a few practice ganache balls if you're new to the pastry bag thing; most of mine came out looking like misshapen Hershey's kisses. (I didn't smack Mr. Food Musings when he laughed at them, but I wanted to.) One hint: smooth down the rough tips with your fingers. Note that the lime sugar has to be made at least a day ahead. Mix the lime zest and sugar and rub between the palms of your hands. Spread in a thin layer on a baking sheet and allow to dry overnight. Make sure it is completely dry, then combine it with the cocoa powder and set aside. Put the chocolate pieces in a large heatproof bowl. Place the butter in a separate, smaller bowl and bring to room temperature. Meanwhile, set the creme fraiche in a pan over med-high heat and bring it to a boil. Grate in the zest from one lime, remove the pan from the heat, cover and let infuse for 10 minutes. Return the pan to the heat and bring just to a boil again. Remove from the heat. While the creme fraiche is boiling, warm the lime juice and honey in a separate pan but do not boil. Pour half of the creme fraiche over the chocolate and stir in small circles, moving outward from the center. Add the rest of the creme fraiche and the lime and honey mixture, and continue to stir until the chocolate melts. Once it is smooth, add the butter a piece or two at a time, stirring gently. Thicken the ganache by chilling it for at least 30 minutes. Stir, then pour the ganache into a pastry bag fitted with a round #9 tip (or improvise by pouring into a small Ziplog bag and cutting off a bottom corner at a diagonal). Pipe balls of ganache onto a parchment lined baking sheet and chill for 2 hours. Spread the cocoa mixture onto a rimmed baking sheet or pan and, with a fork, roll the balls of ganache in it to cover. Remove carefully with a slotted spoon to an airtight container. Store in the fridge, and bring them almost up to room temperature before serving. I never got round to posting my lime truffle post, but i have one saved in my drafts which is entitled "They look like crap but..."
About the halving the recipe - i think i may have switched to grams from cups. I cant remember without looking inside the book, but i have a very nifty pair of scales which measure to an eigth of an ounce and covert to grams and fluid ounces too if needs be. i might have to make some more this weekend. PS I wish someone would do a class on "how to use a piping bag"
I bet these are heavenly. These look wonderful - great photo! Another option for perfectly round truffles is to roll them by hand after piping or skip the piping all together and spoon out and roll the balls directly. Olivia -- credit where credit is due -- the creme fraiche is entirely M. Hermé's idea! Because of the lime, it is hard for me to tell if there is additional tang from the c.f. I suspect if you didn't include the lime you might notice a difference if you have a really fine palate. 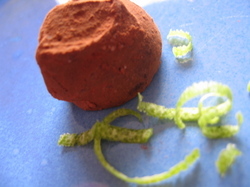 I can also endorse the idea of rolling the balls after piping -- the ganache is pretty sturdy stuff. Olivia - I agree with catherine - the tang of the lime far outweighs any tang the creme fraiche would have. I substitute creme fraiche in about 80% of recipes that call for 'cream' and sometimes you can really note the difference. It depends what else is there with it. That is just fabulous! Er ... any leftovers to send over here? These look and sound delicious, Catherine--and I don't even like truffles! (yes, it's true, I'm not a huge chocolate fan--I've been avoiding telling you for fear you would say that we couldn't be friends, not to mention I might seriously offend your mother). I am going to make these, really. The lime and honey with chocolate sounds divine. I wonder if you could use Key Lime with this... they are easy to find in Florida right now... and I *love* key lime truffles.